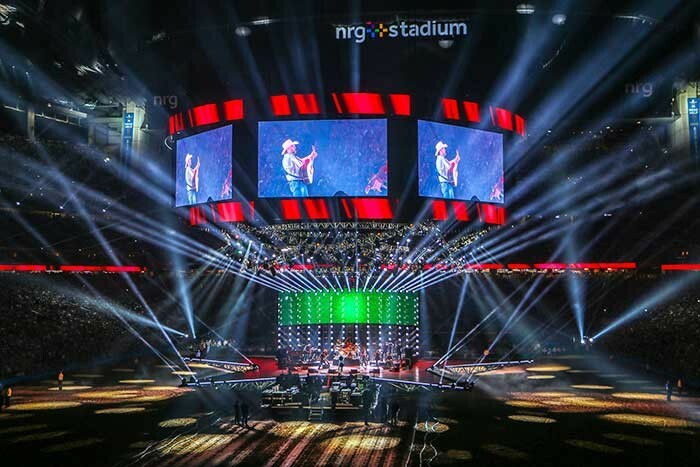 LD Systems, also based in Houston, delivered technical design, live sound, concert lighting, HD video screens, custom truss structures, rigging equipment, production crew and logistics support throughout NRG Park for the entire month surrounding the event. 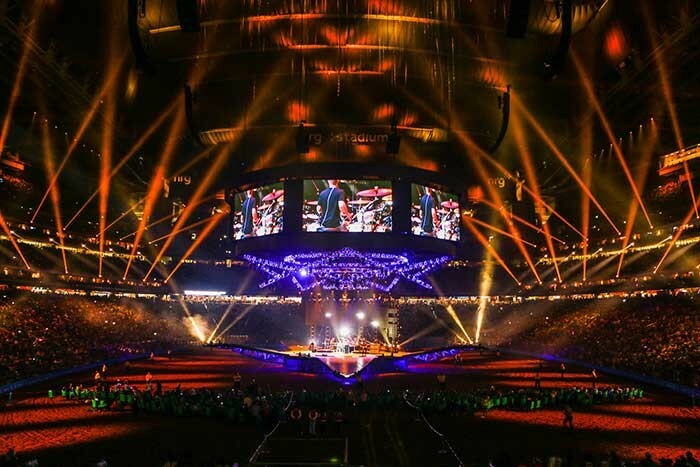 To keep 'wowing' those huge crowds, this year saw the debut of the new ‘Star Stage’ commissioned by HLSR, and a collaboration between LD Systems and staging specialist TAIT, a project that was two and a half years in the making. 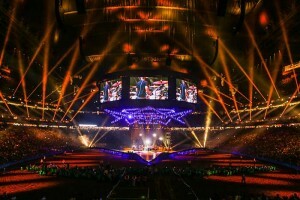 The stage is a mobile structure which is moved and laser guided into place beneath the stadium’s video cube centrepiece, also brought in for the event and used for both the rodeo and the concerts. 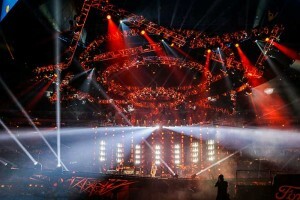 The stage is elevated seven feet off of the surface of the arena, and each of its five 36ft. long star points can be individually lowered or raised to create several unique and different performance spaces. It also features a 28ft. tall by 56ft. wide LED video screen backdrop which has an automated positioning system. That’s when Nathan started looking for suitable fixtures and decided that Robe was the way to go. The 49 MegaPointes, 60 Pointes and 128 Spikies were all purchased by LD Systems from Robe North America, who offered “fantastic support” stated Nathan. Early on in the lighting design process they had identified positions on the stage where they clearly needed a ‘hybrid’ fixture that was small and expedient on power consumption, so the MegaPointe ticked all the boxes together with its impressive feature set which was another excellent plus point. The Spikies were picked because Nathan wanted to populate the vast expanses of overhead trussing with small and powerful sources to fill the gaps between the other core fixtures on the rig. He particularly didn’t want the truss looking like it was empty, bare or had something missing, however, he also needed a small and lightweight source. The original Pointes were chosen as they are workhorse fixtures which Nathan and the LD Systems lighting team have been using for several years on this gig along the ledges of the stadium’s different tiers. “They are essential in helping to scale the show up to stadium size” he commented, as well as creating great back-of-camera effects. The layout of the lighting fixtures, and the MegaPointes in particular, was related to the striking geometry of the stage design. One essential position for these is right at the tips of the star points, which themselves are so large that they create a new lighting position in the stadium that has never previously been possible. They actually give the illusion of protruding further into the arena than the overhead system and a sense of being halfway between the stage and the audience. Because of this key island-like location, and their role in pulling the crowds into the action, these fixtures had to be super bright! Four MegaPointes were positioned on each of the star tips, with more between there and the stage, together with a row of 21 upstage above the video wall. The Spikies on the overhead trusses were deployed on four different levels including lining two circular trusses. The two rows of Pointes were – as in previous years – located on the stadium ledges down the long edges of the field-of-play. Nathan has been using Robe products consistently in this work for the last five years. “I think the brand has established a positive identity through robust feature sets and reliability across all the fixture categories I regularly use,” he stated. The HLSR concert format means there are plenty of visiting LDs for the duration of the event. The new stage, the Robes and all the other fixtures enable everyone to have a unique looking show tailored to their artist and in line with what they would typically produce on tour, but scaled up to fit the venue. The LD Systems team undertakes all the programming and operating in collaboration with the artist LDs, everyone working under time constraints to get the show prepared for that evening. Programming was achieved using three grandMA2 full size consoles, one for the stage and overhead lighting, one for the room illumination and the third for the media servers sending video content to the screens. 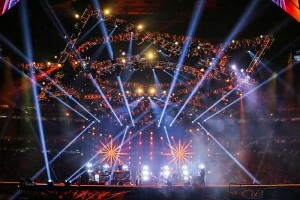 The upper and the lower circular LED screens were 5mm pitch and the eight IMAG screens and eight filler screens in between these were 7mm; LD Systems partnered with Screenworks on this aspect of the technical package, while all the IMAG elements were dealt with by HLSR’s own camera and studio crew. 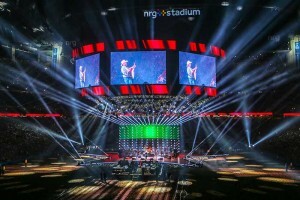 Nathan worked closely on the 2018 concerts with his FOH colleagues Lance Williamson (room lighting programmer/operator) and Travis Crane, (media server programmer/operator) both from LD Systems, together with HLSR’s concert video director Phil Nudelman to ensure the public and artists enjoyed truly world class production values.